I am pleased to advise that Transport Canada and the Canadian Owners & Pilots Association (COPA), have announced the launch of a national 3-year General Aviation Safety Campaign (GASC), at the recent COPA AGM held in Kelowna, B.C. In conjunction with the GASC, a Task Force has been formed to assist in the development, guidance and monitoring of this safety campaign. I am pleased to have been selected as a member of this Task Force, and look forward to participating in regular teleconference meetings with my colleagues from across Canada, with the goal of improving general aviation safety and saving lives in our country. 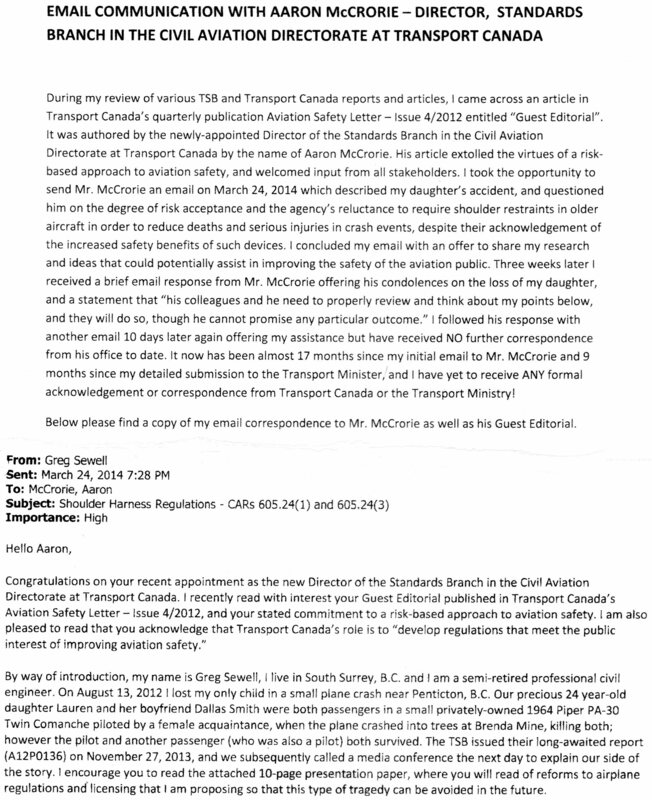 Over the past 2 years since the launch of this website smallaircraftsafetyreform.com, I have continued to dialogue with Transport Canada regarding small aircraft regulatory reform. After getting nowhere in 2015 with former Transport Minister Lisa Raitt, I entered into a new dialogue with the Transport Ministry, now headed by Minister Marc Garneau, following his appointment under the new Liberal government in late 2015. In the ensuing months, separate tragic small aircraft accidents claimed the lives of former Transport Minister Jean Lapierre and members of his family on March 29th and former federal Cabinet Minister and Alberta Premier Jim Prentice and several of his friends on October 13th, bringing new attention to aviation safety in Canada. At the direction of Minister Garneau, several senior Transport Canada officials met with me in Vancouver on February 9, 2017 to advise that, in response to my repeated messages regarding air safety reforms, the Ministry was working with COPA on a general aviation safety campaign. I was advised that this campaign would be based in large part on the circumstances surrounding the tragic deaths of my daughter Lauren Sewell and her boyfriend Dallas Smith 5 years earlier near Kelowna, and would be launched at the COPA AGM in Kelowna in June. I remained skeptical that no regulatory reforms were being proposed at this time, but rather the formation of a 3-year educational campaign. I am now glad to advise that, after attending the recent COPA convention, my faith has been restored in the Ministry. I now have a better understanding of the general aviation mindset, and realize that regulations are only as good as those who follow them. If this campaign can educate pilots to fly safer and hold their responsibilities paramount, the goal will have hopefully been achieved! I wish to thank Transport Minister Garneau for taking a personal role in listening to my urgings, and in the creation of this important safety campaign. I have posted a number of recent media articles, news clips and COPA announcements which follow, that relate to the creation of this air safety campaign. It is my sincere hope that by the end of this 3-year educational campaign, the number of small aircraft accidents and fatalities in Canada will have been significantly reduced. 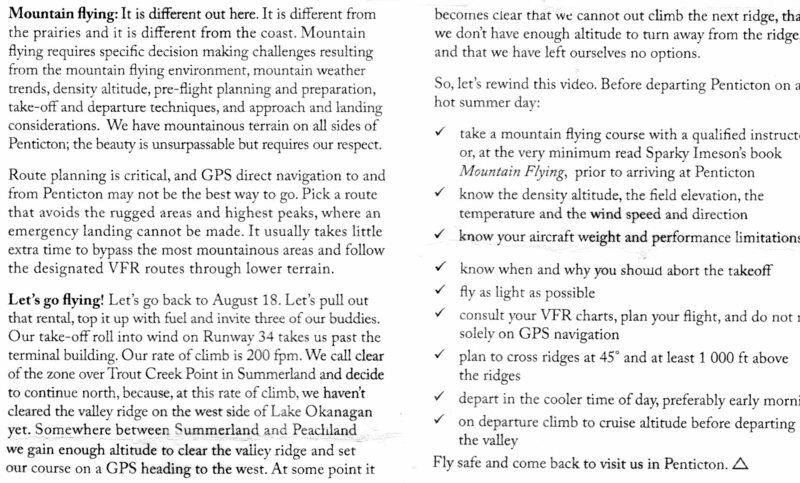 At the recent COPA Convention and Tradeshow in Kelowna, B.C., COPA and Transport Canada announced the launch of a new campaign aimed at educating pilots, passengers, and the general public on key areas related to safety in general aviation. Through an investment by Transport Canada over the next three years, the General Aviation Safety Campaign will highlight important topics in several areas of general aviation. Aimed at both pilots, industry stakeholders, and the public, the campaign will address: promoting compliance with safety regulations, building awareness of safety hazards and risks, enhancing collaboration on safety strategies, promoting Canada’s State Safety Program and safety objectives, and increasing public confidence in civil aviation. The safety campaign represents a partnership between Transport Canada and COPA, supported by an advisory committee comprised of partner associations from across Canada. “COPA is proud to partner with Transport Canada in launching this exciting initiative to not only inform members of the general aviation community, but also the public on some of the important safety topics relevant to general aviation. As general aviation pilots, we take pride every day in committing ourselves to the highest standards of safety both for our passengers and ourselves. COPA is pleased that Transport Canada has chosen to work with us in this educational context in order to avoid imposing costly and unnecessary regulatory burdens on Canadian pilots,”said Bernard Gervais, President and CEO, of COPA. General aviation describes all civil aviation operations that are not scheduled air services, or unscheduled air services for hire. The most common general aviation activities include private aviation, business aviation, agricultural aviation and flight training. It is estimated that nationally, general aviation contributes $9.3B to the Canadian economy and accounts for almost 36,000 direct and indirect jobs. According to recent estimates by the International Council of Aircraft Owner and Pilot Associations (IAOPA), there are more than 350,000 aircraft and 700,000 pilots worldwide who participate in the global general aviation community on an annual basis. In comparison, commercial aviation accounts for only 60,000 aircraft and 400,000 pilots. This demonstrates the vast size and significance of the general aviation sector, worldwide. The Canadian Owners and Pilots Association (COPA) and Transport Canada have announced the launch of a new campaign aimed at educating pilots, passengers, and the general public on key areas related to safety in general aviation. Through an investment by Transport Canada over the next three years, the General Aviation Safety Campaign will highlight important topics in several areas of general aviation. Aimed at both pilots, industry stakeholders, and the public, the campaign will address: promoting compliance with safety regulations, building awareness of safety hazards and risks, enhancing collaboration on safety strategies, promoting Canada’s State Safety Program and safety objectives, and increasing public confidence in civil aviation. The safety campaign represents a partnership between Transport Canada and COPA, supported by an advisory committee comprised of partner associations from across Canada. General aviation describes all civil aviation operations that are not scheduled air services, or unscheduled air services for hire. The most common general aviation activities include private aviation, business aviation, agricultural aviation and flight training. It is estimated that nationally, general aviation contributes $9.3B to the Canadian economy and accounts for almost 36,000 direct and indirect jobs. “The safety of the aviation community is a priority for Transport Canada. Through this campaign, the department is taking a proactive approach to safety by collaborating with key stakeholders to promote regulations, build awareness of risks and educate passengers, aircraft owners and maintenance providers on safe aviation practices,” said Aaron McCrorie, the director general for civil aviation at Transport Canada. According to recent estimates by the International Council of Aircraft Owner and Pilot Associations (IAOPA), there are more than 350,000 aircraft and 700,000 pilots worldwide who participate in the global general aviation community on an annual basis. In comparison, commercial aviation accounts for only 60,000 aircraft and 400,000 pilots. This demonstrates the vast size and significance of the general aviation sector, worldwide. 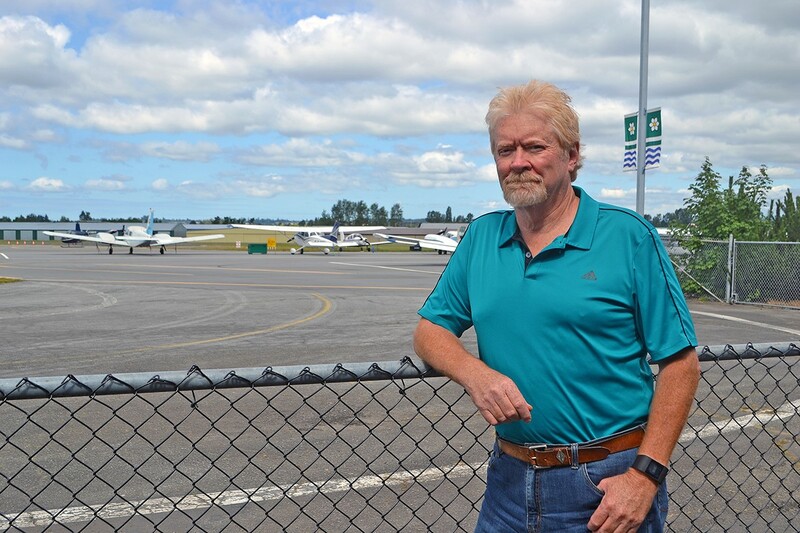 “The TSB fully supports this cooperative initiative between COPA and TC to increase awareness and promote the proactive management of safety in general aviation,” said John Lee, manager of regional operations and air investigations for the TSB’s western region. Belinda Bryce, Partner, Aviation, of the Magnes group told the panel that clear trends emerge from claims data and 50 percent of claims involve landing accidents. She said a cooperative approach is needed to address systemic and cultural issues at work. Mark Vanderaegen, the flight school director for Southern Interior Flight Centre, said pilots at all levels need to continuously train to keep up with rule and flying environment changes. “Regulations, technology and aeronautical support systems develop on a continual basis in aviation, requiring ongoing training for every pilot. Initiatives like this allow pilots to continue to fortify their skills and help to make Canada stand out as a leading country in aviation safety,” he said. After advocating for regulatory changes for years – and even though this announcement hasn’t quelled that drive – Greg Sewell said he is hopeful the education effort will save lives. 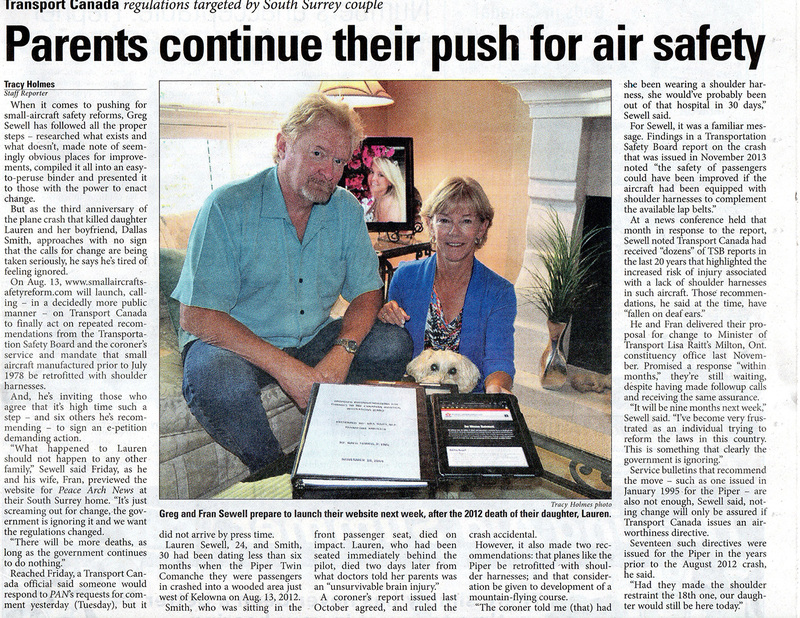 “It wasn’t what I was pushing for,” the South Surrey resident said Monday. “Then I realized, education is the way to go… as opposed to legislation at this time, to have a better impact on safety reform. 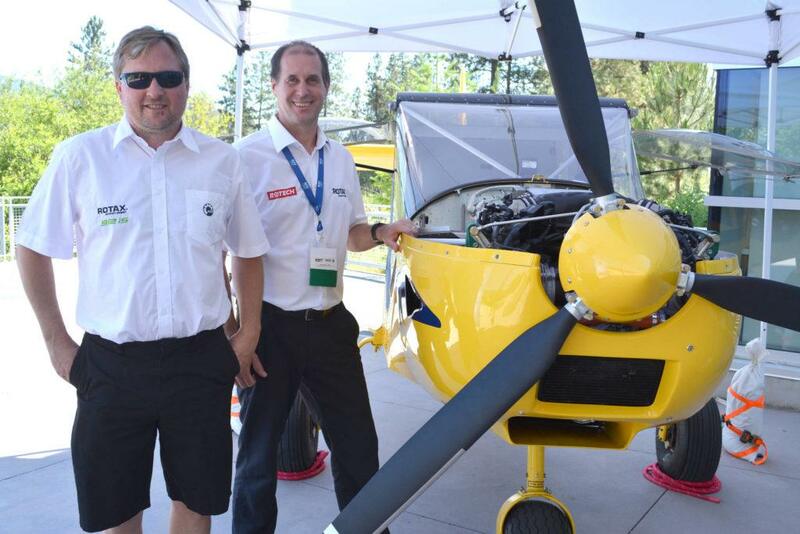 The three-year campaign was announced in Kelowna on June 24, at the Canadian Owners and Pilots Association’s 2017 Convention and Trade Show. Sewell said he was advised of the campaign in February, during a meeting in Vancouver with Transport Canada officials, and was invited at that time to be part of a task force to track its progress. Sewell and his wife Fran have been pushing for changes since their daughter Lauren died after the private Piper Twin Comanche she was travelling in with her boyfriend Dallas Smith crashed at the Brenda Mines site near Kelowna on Aug. 13, 2012. Smith – who was also raised on the Semiahmoo Peninsula – died on impact; Lauren, 24, suffered an unsurvivable head injury and died the next day. The coroner told the Sewells that Lauren would have likely survived had she been wearing a shoulder harness; in a report issued in 2014, it was recommended such planes be retrofitted. 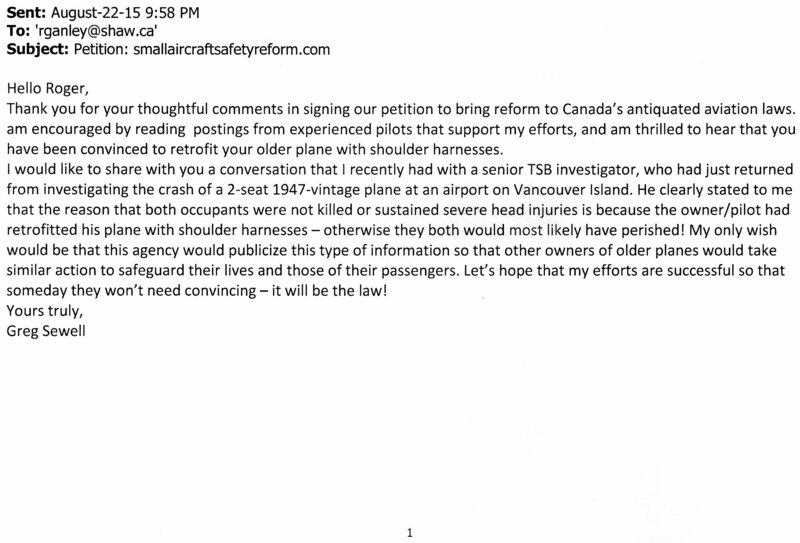 The following August, Sewell launched a website (www.smallaircraftsafetyreform.com) calling on Transport Canada to act on repeated recommendations from the Transportation Safety Board and the Coroners Service, and mandate that such crafts manufactured prior to July 1978 be retrofitted. That same month, Transport Canada officials said the change was “not practical” and would endanger passengers. 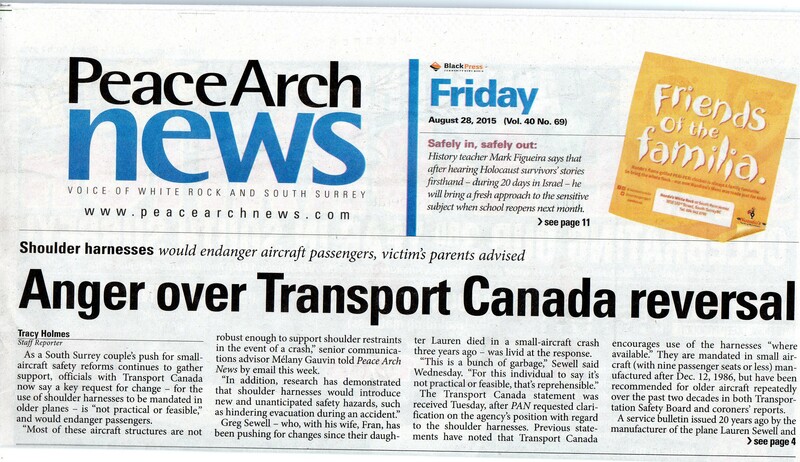 “Most of these aircraft structures are not robust enough to support shoulder restraints in the event of a crash,” a senior communications advisor told Peace Arch News by email at the time. Sewell said he believes a strongly worded email that he sent to Minister of Transport Marc Garneau in May 2016 – criticizing the ministry’s inaction – was key in driving the latest announcement. 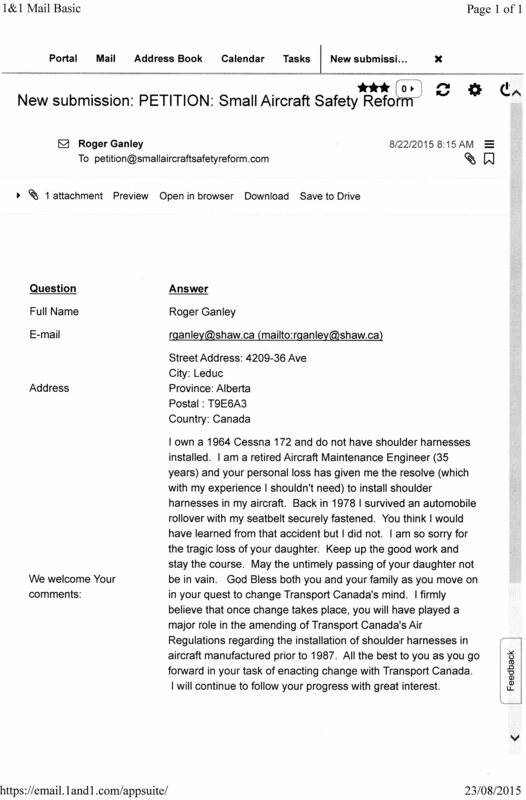 “I just ripped him a new one, because he was totally dismissive” of an earlier email regarding proposed changes around shoulder harnesses, Sewell said. In presenting his case to Transport Canada officials in February, Sewell said he set side-by-side photos of his father and Lauren – both at the same age – to drive home his point. “He came back safe,” Sewell said of his father, who flew multiple bombing missions during the Second World War. “My daughter goes up for the first time in her life, in a small private plane, and never makes it back. Him giving his life to the service and her counting on government to have the proper safeguards in place. Sewell was in Kelowna for the June 24 announcement, and told PAN he could sense his daughter’s approval. “I find it ironic that this national campaign would be launched so close to where the accident occurred, and felt her spiritual presence during the announcement telling me, ‘good work, Dad. You never quit’,” he said. Since his daughter Lauren was killed in a plane crash five years ago at Brenda Mines, Greg Sewell has been advocating for small aircraft safety reform. “I have taken it upon myself to try and educate regulators that there are changes required,” he said. On Saturday, the Canadian Owners and Pilots Association announced a three-year safety campaign, in partnership with Transport Canada and several organizations across Canada, focusing on general aviation, not including commercial or military aviation. Sewell is on the task force for this campaign, and he is optimistic about the impact it will have on aviation safety. Fifty per cent of aviation accidents occur in small, private planes, and in some years, 100 per cent of fatalities occur in those aircraft, said Aaron McCrorie, director of general aviation for Transport Canada. One of the most important ways of making general aviation safer is by changing habits and changing the way people think about aviation safety, said McCrorie. Currently, the campaign is in the inception phase while COPA and Transport Canada determine what the main issues are and ways of educating pilots about those issues. “It’s an awareness campaign, but I think something real will come out of it,” said Bernard Gervais, president and CEO of COPA. “We still have some scoundrels who will just do anything, and they’re most likely the minority, but if we can get these out of our ranks, I’m certain we’ll have a better safety record,” he said. A new campaign is aiming to educate pilots, passengers and the public about safely operating planes in the private sector. A panel which included members from COPA, Transport Canada, the Western Canada Safety Board, the Southern Interior Flight Centre and a partner group addressed a full audience, Saturday, June 24 at UBCO. One of the main issues discussed during the forum was although commercial flight accidents have decreased, general aviation flight (anything but scheduled and non-military planes) accidents have not. These accidents mostly occur during the take off and landing phases of flights, said COPA President Bernard Gervais. About 60 per cent of all incidents occur during those two phases of flight, he said. The three-year campaign includes associations from across Canada, which will gather information to increase safety awareness. Greg Sewell is a resident of Peachland and Surrey. His daughter, Lauren Sewell, was killed in a plane crash five years ago. He said if there were shoulder restraints in the plane, she would have lived. Sewell would like to see a change in shoulder restraint awareness. He said approximately half of the small planes flying in Canada were built before 1985. Shoulder restraints are only required in planes built after that year. “The safety campaign represents a partnership between Transport Canada and the Canadian Owners and Pilots Association supported by an advisory committee comprised of partner associations from across B.C.,” reads a COPA release. The forum was held during COPA’s annual convention and trade show. Firstly, our hearts go out to the families of the 6 people who perished in this terrible accident, and we offer our sincerest condolences on this unfortunate loss of lives. As you will note from the foregoing article, the accident plane was an older commercial seaplane built during the 1950’s. The TSB has commenced their investigation into this fatal seaplane crash – the 2nd in the past 5 years involving the same commercial carrier Air Saguenay. While it is much too early to speculate, given the vintage of this airplane, it is highly likely that this plane was equipped with only lap-belts to protect the pilot and/or passengers in the event of a crash – although if it had indeed been retrofitted with shoulder restraints for all occupants, then I applaud the airline for taking these potentially life-saving measures. From the picture provided in the article, it would appear that the plane crashed into a wooded area and not into open water. Given that all 6 occupants perished in the crash, it is premature and insensitive to their families to suggest that shoulder harnesses may have saved their lives. 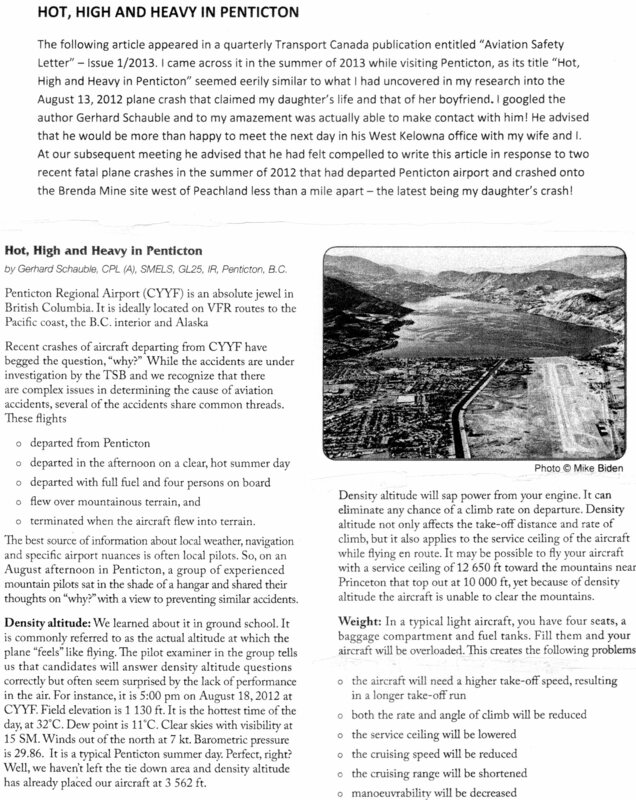 Nevertheless, it is important to point out that following the crash of a similar vintage de Havilland Beaver floatplane on May 25, 2012 at Lillabelle Lake, Ontario, the Transportation Safety Board (TSB) conducted a detailed investigation (Report A12O0071) which included a vital safety recommendation that “The Department of Transport require that all seaplanes in commercial service certificated for 9 or fewer passengers be fitted with seatbelts that include shoulder harnesses on all passenger seats.” As you may have read earlier in this News & Research section of our website, I have emailed Transport Canada’s Aaron McCrorie on two separate occasions asking what actions Transport Canada has taken in response to this TSB recommendation (A13-03), and I have received NO response. Therefore I must conclude that they have done NOTHING! I encourage the reader to visit the TSB website and download and read this TSB report, as it references several earlier Board recommendations regarding the requirement for shoulder restraints. However Transport Canada continues to ignore such recommendations by allowing all small airplanes manufactured prior to December 12, 1986 to continue to operate with only lap-belt protection for all passengers. Let’s hope that this “grandfathering” provision is ended soon, before more passengers and pilots are killed or seriously maimed as a result of inadequate safety provisions. We anxiously await the release of the TSB report into this latest Quebec seaplane crash and the findings relative to the provision (or lack thereof) of shoulder harnesses. 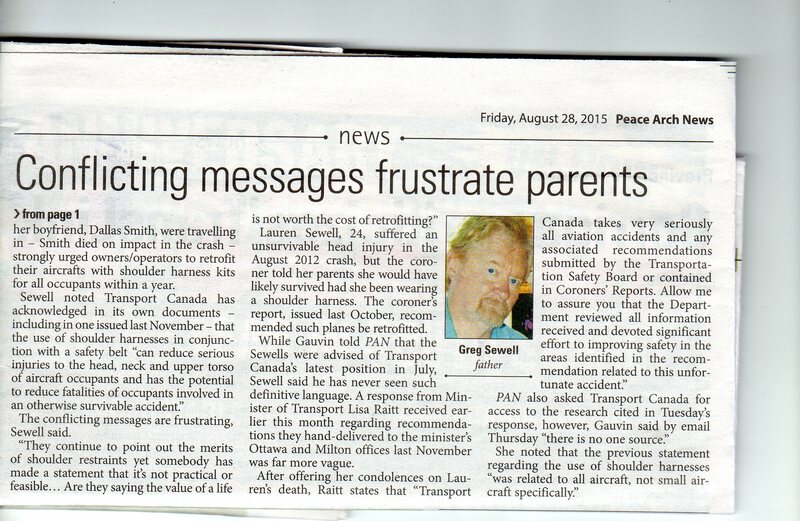 I have outlined throughout our website that I am appalled by the complete lack of response from the federal Transport Minister or officials within Transport Canada to the various documents regarding proposed changes to the Canadian Aviation Regulations (CARs) that I have submitted over the course of the 3 years since my daughter’s tragic accident – that was until recently! How do we know that a federal election is upon us? Well, many politicians issue statements and responses that sound good but say absolutely nothing! 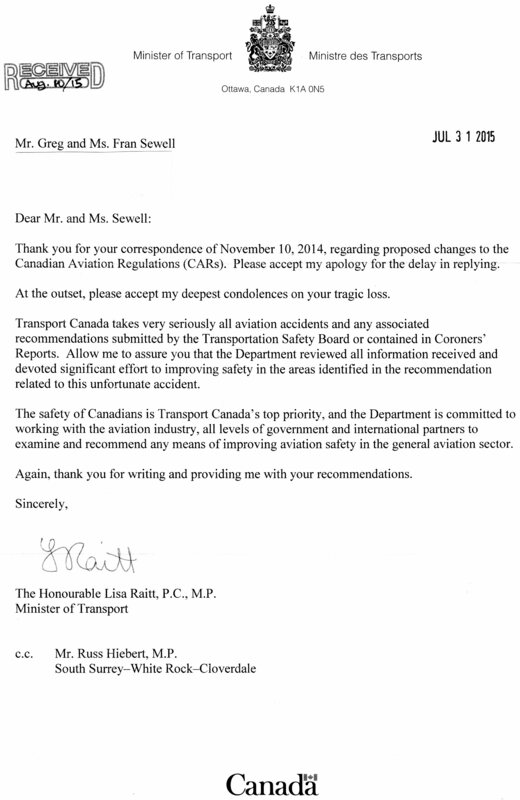 Case in point – on August 10th we finally received the long-awaited correspondence from Transport Minister Lisa Raitt, responding to my detailed personal submission of November 10, 2014 to the Minister’s constituency office in Milton, Ontario. (Note: I have added bold print to certain words for emphasis.) In her letter, the Minister apologizes for the delay in replying and offers her condolences on our tragic loss. 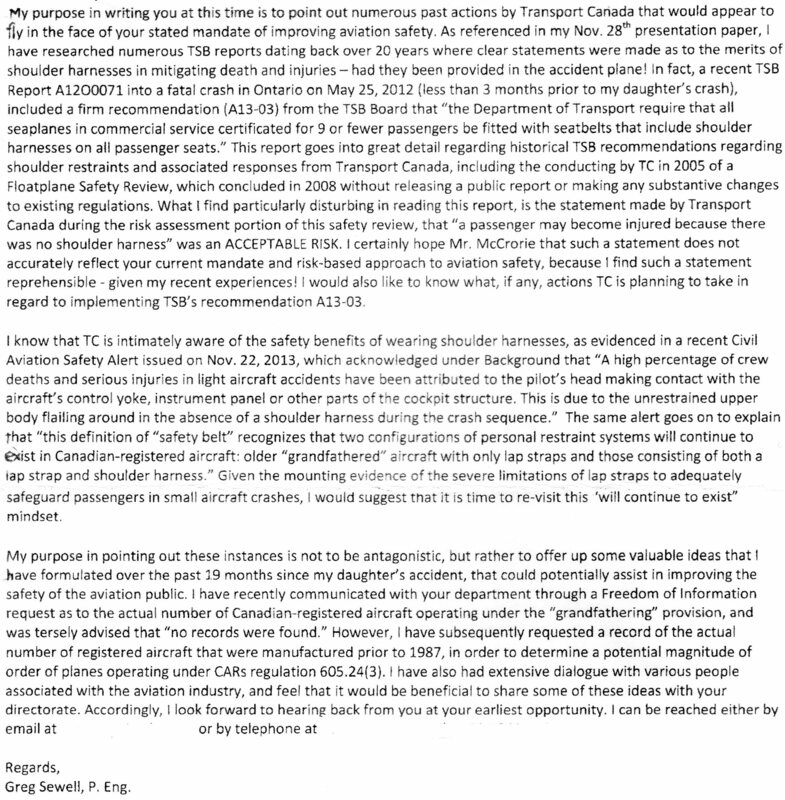 The letter goes on to advise that “Transport Canada takes very seriously all aviation accidents and any associated recommendations submitted by the Transportation Safety Board (TSB) or contained in Coroner’s Reports. 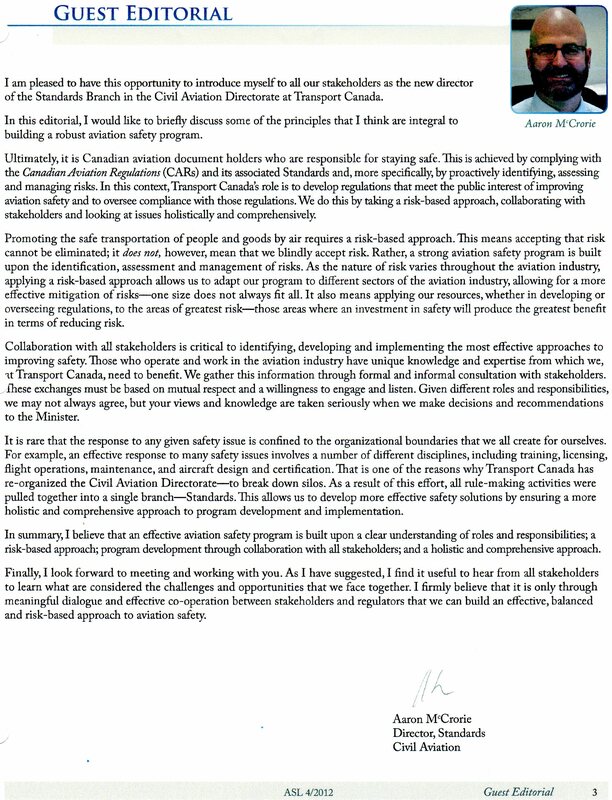 Allow me to assure you that the Department reviewed all information received and devoted significant effort to improving safety in the areas identified in the recommendation.” The letter then acknowledges that “the safety of Canadians is Transport Canada’s top priority”, and closes with the words “thank you for writing and providing me with your recommendations.” I ask – where is there any mention of what efforts are being made to improve the safety of Canadians, and where is the acknowledgement that any of my recommendations have even been considered? We find this reply by the head minister in charge of transportation in this country to be totally unacceptable. Canadians deserve a better response to proposed safety reforms for an industry that is in dire need of better regulations. The Minister’s response would clearly indicate that this agency is prepared to only respond to the recommendations made by TSB or Coroner’s Offices and not to the affected concerned public! As the Minister of Transport has clearly stated, the safety of Canadians should be Transport Canada’s top priority.